BLACKBIRD is a short film by Australian Solomon Islander filmmaker Amie Batalibasi, that sheds light on a little known part of history – Australia’s sugar slaves. Ronin Films will release the BLACKBIRD DVD 4th JULY 2018, 9am AEST. BLACKBIRD screened at the New Zealand International Film Festival in July 2016; imagineNATIVE Film and Media Arts Festival in Toronto, Oct 2016; the Pasifika Film Festival, Sydney and Brisbane 2016, where it picked up the ‘Best of the Fest’ award and Maoriland Film Festival where it received the People’s Choice Audience Award for Best Short. 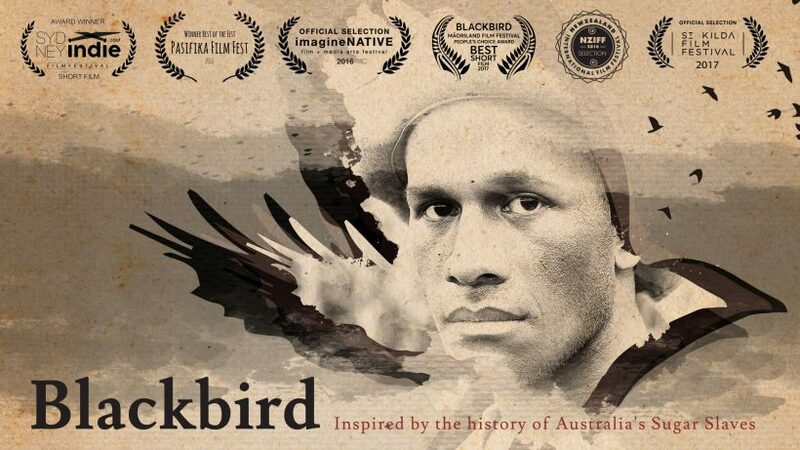 BLACKBIRD was awarded Best Drama and Best Female Lead (Regina Lepping) at Sydney Indie Film Festival, 2017 and the film had it’s television debut on NITV/ SBS OnDemand in 2017. • AUSTRALIA: Private home use: AUD $25 (including postage and handling) Please note: this is a discounted price especially for BLACKBIRD supporters. • INTERNATIONAL Private home use: AUD $35 (including postage and handling) Please note: this is a special international orders price for a limited time only. • Educational institutions, libraries and community groups etc: prices vary and are more expensive due to copyright. You should select the appropriate options from the drop down menu when ordering or contact: orders@roninfilms.com.au to get a quote and organise payment. You can pay via credit card, PayPal or contact Ronin Films for invoices/ purchase orders. Delivery within Australia is generally as follows: between Capital cities 2-3 days, Regional areas up to 5 days, WA & NT can be up to 7 business days. Overseas mail is generally 7-10 days. The film was completed in 2015, shot on location in Mackay, Queensland. The BLACKBIRD DVD will be available in Australia and internationally for private home use and for educational institutions, libraries, schools, university etc.